First photo is Dix Island, looking southwest. Some funny things happen when the tide runs in and out among the islands in Maine. Current directions are often not what you would expect, as the currents are shaped as much or more by the underwater topography as by the surface outlines of the chunks of land. In a complicated group of many islands, it turns out that the current can appear to run backwards, flooding toward the sea, and ebbing up the bay. This can come as quite a surprise! 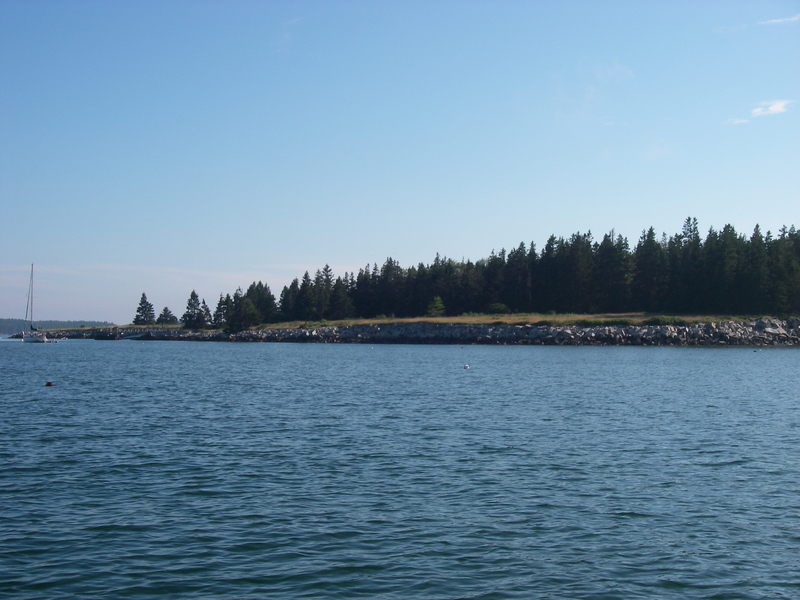 Birch Island is part of a group of islands at the southwest corner of Penobscot Bay. In the chart up above (click on the photo to make it bigger) you can see both a detail of the island group, and where that group sits in relation to the much larger mouth of Penobscot Bay, which opens to the south into the Atlantic Ocean. Birch Island itself forms a nice harbor, together with High Island to the north, and some shelter from Dix toward the southwest, as well as other bits of land and rocks to the east. This is a sweet corner in which to spend a few days, but not so much fun if the wind goes to the west and northwest. On my way east this summer, after a couple of lovely days in that anchorage, a squall line followed by strong northwest wind was forecast to arrive during the night. I decided to move around the corner to a small cove on the southeast side of Dix, which was a short sail, less than a half mile, south through a narrow slot between the islands. Since I had all day, it was easy to check the current tables and plan to let the current do the work to tack against the light southerly wind. Feeling very well organized, I waited until the tide had had a chance to get more than halfway down, and then pulled up the anchor and started sailing. Turning the corner around Birch Island, I was a little surprised to find the current still running toward the north, but figured that it was just a major lag in the current change after the tide started to fall. I didn’t have far to go at that point – a few hundred yards – and started tacking in the narrow channel, making a bit of progress with each round. The tide runs pretty strongly in this part of Penobscot Bay, but I figured that it should be easing and then eventually turning, so why not continue with this little tacking clinic, waiting for the change and making tiny bits of progress. The funny thing was, the opposing current was actually strengthening! First I attributed this to that I was getting into the narrowest part of the channel. Finally, when I was making no progress whatsoever, I decided to anchor on the shallow side, and wait for things to change. Right there in that spot, the current continued to increase. So much for my theory that I was moving into the stronger flow! Eventually it was truly obvious that the current I was experiencing was the one that was going with the main body of the ebb tide. But if you look on the charts, you’ll see that this ebb was headed straight north, up the bay, away from the open ocean that you could clearly see through the islands. Fascinating! I had been quite determined to not use the motor, and was happy to wait this out and watch the physics show to which I was being treated. Then some truly enormous, very black clouds started to come up in the west, headed our way. By this time it was about four o’clock, and evening would soon be approaching. Where I was anchored was going to be a terrible lee shore when the northwest wind filled in, and I didn’t want to just go back to where I had been. The old spot would have been safer than where I was, but miserably uncomfortable, and with potential for trouble if the wind became stronger than predicted. Up came the anchor, and for kicks I tried some more sailing against the current, losing ground on each of two tacks. Motor on. This is why it’s there – for getting out of tight spots, and having the opportunity to think through what I could have done differently that would have avoided this particular motor use. Once the little electric motor was going, in five minutes I was around the corner into that cove, and sailing again, turning circles and taking soundings. After finding a good-looking spot, down went the anchor, in time to watch the squall come through. Dix Island has a nice bit of a bluff, and lots of tall trees, so it was a great spot for hiding from west and northwest wind. Thinking back, of course what I could do differently in the future is to try that move when the tide is flooding, and flowing toward the sea! But if I had this original situation again, when I started to lose ground during the first attempt I could have picked up one of three empty moorings on the west side of the channel, asking whoever came along if that was okay. I hesitate to do that sort of thing when I have a perfectly good motor on the back of the boat, that could get me to a very nearby safe anchorage without imposing on somebody else’s gear, but it really was an option. Anchoring adjacent to the moorings would not have worked, as it’s the deep side of the channel, and with enough anchor line out the boat would have swung into the frequently used path for other boats. As it turned out, Reilly (of the delicious lobsters) came by later and said that it would have been fine to use one of the moorings for the night. But it was nice in the cove I ended up in, and I was very happy to be there. The next morning, when it was time to leave I was headed for the ocean, to go further up the coast. There was still the network of islands to pass through, in order to get out to that open water, and still the question of current. 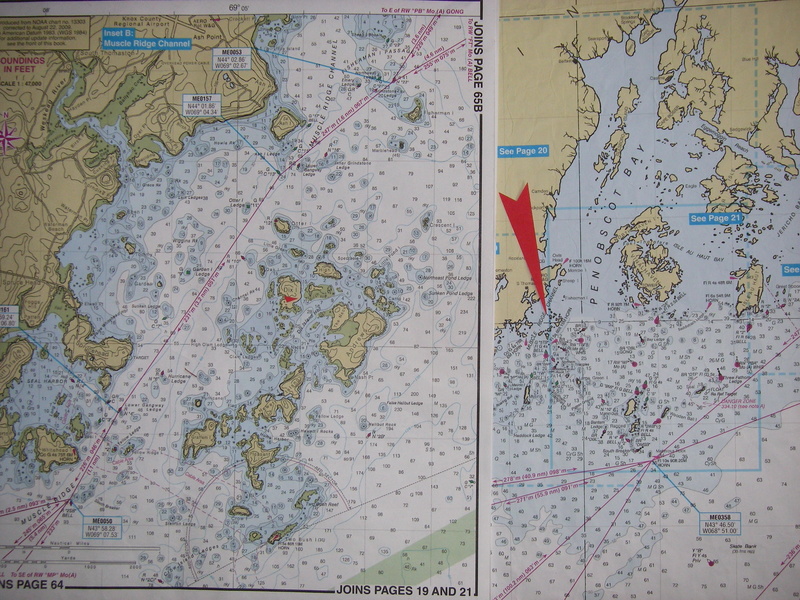 In the Muscle Ridge channel, which you can see on the chart to the west of the islands, the tide runs strongly, in the direction that you would expect. I guess in among the islands there are some giant back eddies, or some other trick of hydraulics in the complicated network of passages. Anyway, at 6 AM the tide would be about an hour into rising, having been low around five. I made a plan to take a chance and depart at that time, headed south between the islands just after dawn, toward the ocean. At least the tide would not be running strongly at that time, whatever direction it was going, and if I was lucky, I would get a ride in the right direction. And it was true! That tide, flooding, ran straight toward the open water. I went out just west of Andrews Island, and the tide stayed fair until the last bit just before it cleared the islands. This is the sort of thing that one doesn’t forget, especially with the minimal motor. The title has been on my mind for months, and I’m glad to have finally written down the story. I’ll be even more glad to go back to that area, and to ride the tide backwards between Birch and Dix islands, going with it rather than against. I still don’t quite believe that it does it this way every time, but it’ll be fun to go find out. Eldridge Tide and Pilot Book has nifty tidal current charts of several areas, but none farther north than south coastal Massachusetts. For Maine waters there is a page of narrative description, and then a table of current change times and directions for about two dozen locations. Don’t know why there are no charts, which show the situation in a glance. Yes, Eldridge is wonderful. That’s what I use all up the coast, and you can get a good line on the primary currents in Penobscot Bay from there, including for the Muscle Ridge Channel. The tricky thing is that there are so many zillion small islands, and each of the passages between them has its own personal current dynamics. Because there are so many passages, and most of them are not used by commercial traffic, for the most part they don’t get measured or covered in the book. Instead they fall in the category of “local knowledge.” But it sure does keep things interesting! I agree with you, those little series of current charts in Eldridge are fantastic. It would be great if somebody made those for Maine, or at least for Penobscot Bay. There’s a nice set for “the Bay of Fundy and the Gulf of Maine,” from the Canadian government, but the scale doesn’t have enough detail for most of the Maine coast. Sure does come in handy when you start going up toward Eastport though.